There is no charge for time spent travelling. Mileage is charged at 40p per mile (calculated on a return journey from TA4 2NT). Groups, clinics and talks can be accommodated. Please contact Jenny for more information. Hands On Horsemanship Courses throughout the year at Horseworld, Bristol. For more information, visit the contact page. Jenny specialises in handling untouched ponies. 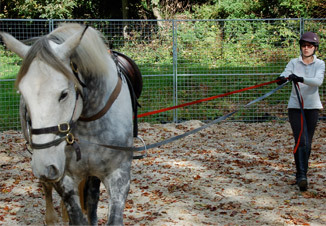 Jenny offers one to one sessions with you and your horse at your premises. You may have a particular problem you want to concentrate on, or it might be that you just want to improve your relationship or learn new skills and techniques. Initial consultations usually last around two hours, depending on what you want to cover and what is appropriate for the horse. A certain amount of information will have been established via telephone or email prior to your appointment, so Jenny has a good idea of the background before she arrives. During the initial consultation Jenny will observe you and your horse and analyse any problems or concerns and identify areas where improvements could be made. The next stage is to identify realistic goals and suggest a training plan. A hands on session will then take place, focussed on you working with your horse, to achieve your full potential. The aim is to provide you with the skills and techniques you need to progress together after the session. Follow up notes giving an overview of the session are provided by email at no extra cost. In many cases, only one session is required to provide you with the skills and techniques you need to continue forward together. However, with more complex cases, follow up sessions may be suggested, which are usually shorter in duration. There are some circumstances (such as loading) where a longer session may be required, although your horse will be given appropriate rest breaks, as welfare is always the priority. Please note Jenny is only able to work in conditions considered safe for both horse and owner. This will be discussed when making your booking.